Before creating your free offer to email subscribers, you should set up your email list first. You can read our blog post How to Build an Email List for your Therapy Practice to help understand the mechanics behind creating your email list. Once you’ve created your list, you then need to create a subscription box on your website so that readers can enter their details to your email list and then receive the free offer you are providing. The method of setting up the subscription box on your website will depend on the website framework (eg. WordPress), theme (eg. Elegant Themes, Divi) and the email service provider (eg. 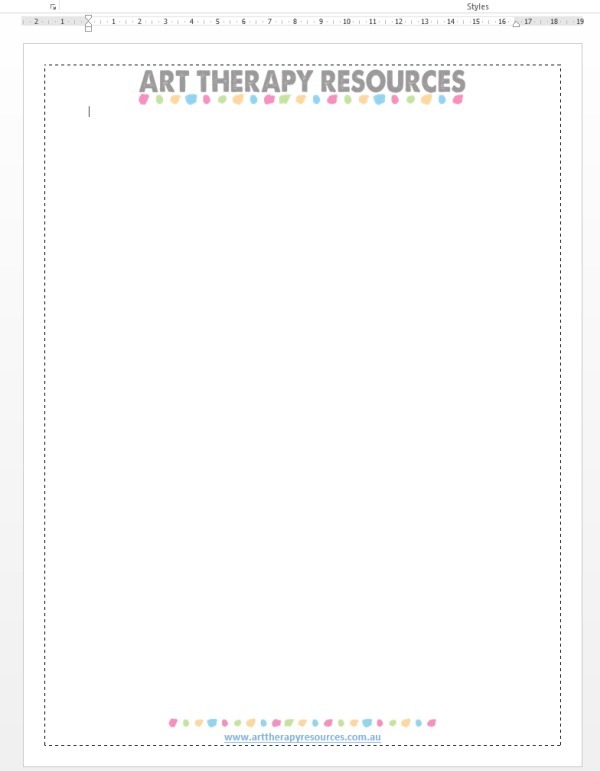 MailChimp) that you use. Most companies provide easy step by step guides on how to link your email subscription service to your website. Outside of whatever website platform, theme, or email provider you choose to use, there is also a number of 3rd party plugins that will facilitate the process. Initially, you should create one free offer for your readers to sign up to your email list, however, over time you should add additional free incentives. Many of your readers will come to your website seeking different information that is relevant to them. You may get readers coming to your website to learn about art therapy and depression and you may get other readers who come to your website to learn about art therapy and anxiety. The best outcome is for you to have a free offer available for both readers. On this site, Art Therapy Resources, we offer a free downloadable offer on the home page (shown below). Then each blog post also has a different free offer available to download based on the content of that post. For example, each of our CASE STUDIES has their own specific free offer available for download based on the individual case study information. Currently, we have over 50 different free offers to download. This is a lot compared to what a private practice therapist will need for their own website. Initially, you should aim to create one free offer that appeals to the clientele that you wish to attract. Over time you can add more free offers as a way of experimenting on what incentives your readers are looking for to sign up to your email list. If you do create one single free offer and it is effective in gaining new subscribers then continue using that same free offer throughout your website. You may also want to create additional free offers that expand on the original. When deciding on the content of your free offer you should try and understand your audience and what will entice them to want your free offer. You should try and understand the problems that your potential readers are looking to resolve and base your free offer around solving this problem. This could mean educating your readers on a problem they have and don’t understand (eg. common signs that you may be depressed). As a therapist, you need to create free offers that are ethical and do not cause harm or distress to your potential readers. Your free offer should not include any promises to fix mental health problems by simply reading your free offer or using a worksheet. Your free offer should be helping your reader develop their knowledge and understanding of their problem with a clear statement that you can personally help them with that problem. Self-care tips and easy art as therapy exercises are helpful for readers. You should clearly explain the difference between art therapy and art as therapy so that your reader doesn’t misunderstand your free offer as therapy. How long will it take you to create the free offer? Aim for a day at most. Remember you can change or amend your free offer in the future. Your free offer should be something that will help your reader and also act as an incentive for the reader to provide their email address to receive it. Your offer should be clear that the reader provides their email address with the knowledge that doing so will add their email address to your email list for future communication about your business and the products and services that you offer. A free offer can be made available in a variety of formats. You can also create one piece of content and make it available in different formats to suit your orders. For example, you may create a worksheet and make the same worksheet available as an Excel Spreadsheet, Word Document, Evernote document, or pdf document. How you create your free offer will depend on the software that you have available to you. Most Microsoft, Adobe, and Apple products will enable you to create a document that you can save in a variety of formats and distribute to readers via download. Write a draft of the content you wish to include in your free offer. This draft does not have to be formatted or put into a final presentation format. This stage requires that you simply create the content that you will then format later. The reason you want to write your draft content first is so that you can freely write and edit without having to worry about your final presentation which may change each time you edit your content. Once you’ve drafted your content, edit it to ensure your offer is simple to understand and actionable for your reader. Decide what software you will use to create your free offer. For the purposes of this example, we will use Microsoft Word. Your free offer should include some details about your business so that your reader knows the source of the document and how to contact you in the future. This document is part of your marketing process and should include your business details. Below is an example of an Art Therapy Resources template that is created using Microsoft Word. This template can be used for any number of free offers as the logo and website remain the same for each document. Place your written content into the document and format it the way you want. Include written instructions on how to use your document if necessary. 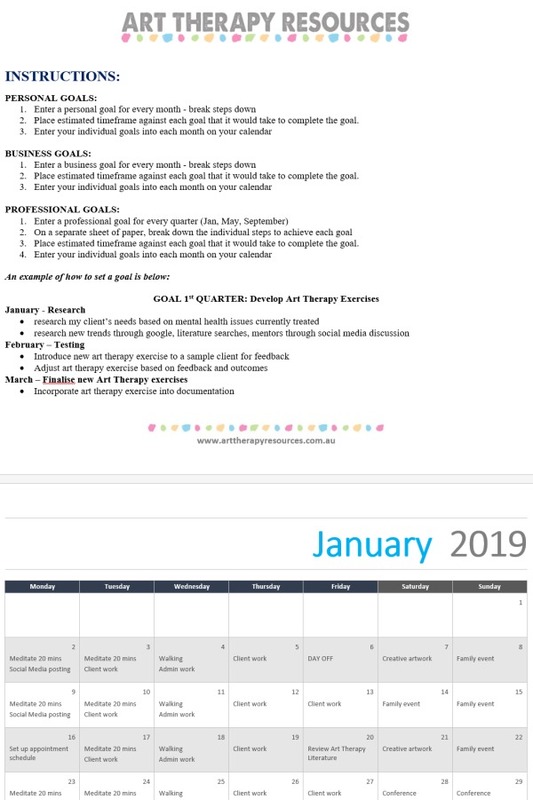 An example is shown below based on a free goal setting calendar template. Save your document into a format suitable for your client to download. Promote your free offer across your website, social media, direct advertising, and other appropriate avenues. 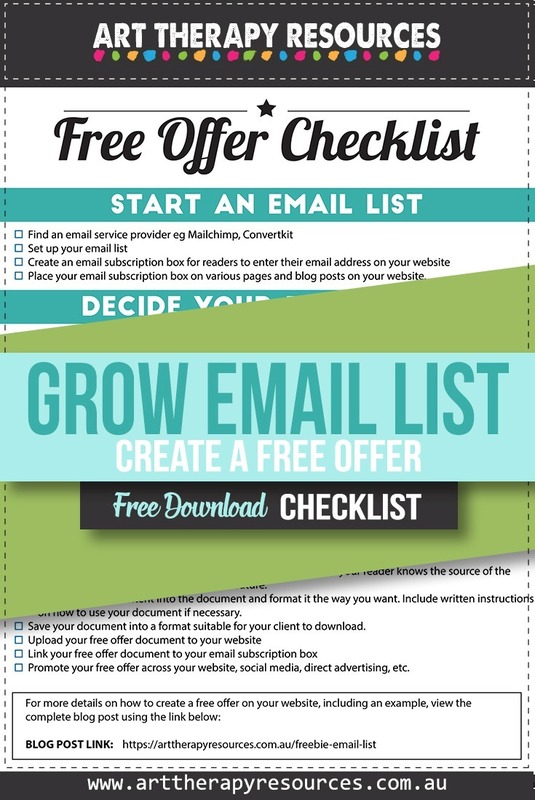 SIGN UP below to download the FREE Offer Checklist to create your email sign up free offer on your website. 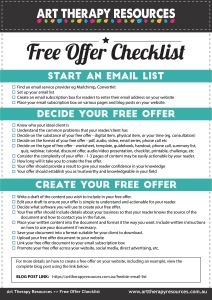 Download the FREE Offer Checklist.